So Pokemon.com recently updated with the English release news, and with it, they released a map of the new Kalos region, based off of France. It looks very similar to the actual geography of France, with similarly located cities and landmarks. Now, the only confirmed city so far is Lumiose City, the biggest city of the game. It has an Eiffel Tower-looking building in its center, at the junction of many roads, similar to the placement of the real life Arc de Triumph, and a river running through it, which seems to be La Seine. There are also locations evident that were seen in the original trailer. The raised buildings and wind turbines can be seen in the top middle of the map, and what looks to be a giant tree, which the character was swinging on, looks like it might be in the bottom right corner. - The very top of the map looks like what will be the staring town; there are a few small houses and possibly the local professor's laboratory. - The snowflake windmill: the town's gym? - The eastern mountain looks like it holds a huge cave system, and the are some mineshaft entrances on the southern part of it. - Is that... a giant purple hand popping out of the water? - Lots and lots of manors and gardens. Something tells me that there will be more of these than towns, and gym leaders might be the heads of the manors. - The tall building in the west is almost definitely the Pokemon League. It's a tall, ornate building, secluded from the rest of the map, and there's a cave right before it. Yep, that's almost definitely it. Also, we can almost count on Fantina making a cameo in one of the cities, since after all, she is French, and maybe we'll get to find her hometown? So what do you guys think of the map? Any places catch your eye? Any ideas on what each building might be? And yeah... this purple hand is odd. I expected more cities and towns! ~Are they gonna do England then connect it to "Kalos"? Here is my guess at the route connections (not exhaustive). I think the southern buildings are the home town. I actually agree now that the southern buildings do seem to be the starting town. I saw a picture floating around that pretty much proves it, so I'll edit it into my post if I happen to find it. Image to go with my post. -There is a cathedral type building in the east. -A lone tree. Possibly the one from the trailer. -Those Islands are based on the Channel Islands. -The stone circle and rows are the Carnac Stones. -This building from the trailer. 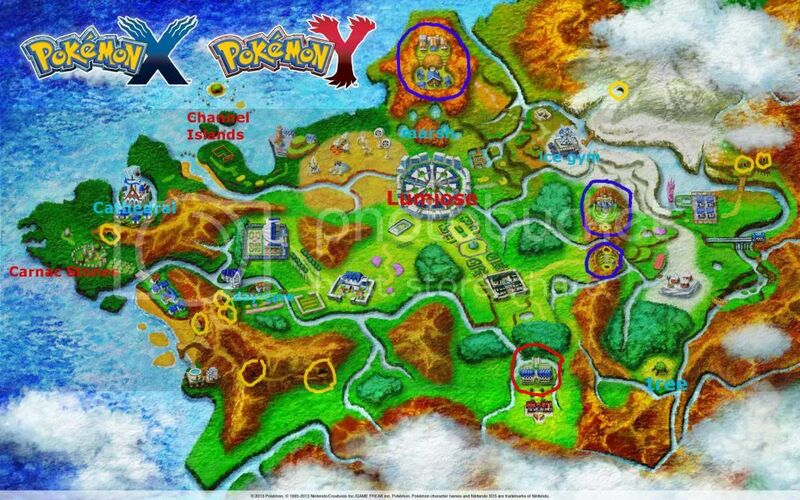 -The top area is shaped like the entire Kalos region. -The lower area on the right has steps leading from one cave to another, and a small stone building. There's a lot more, but I'm not going to the hassle of finding everything out. Another interesting thing is that, from the bottom middle to the bottom left, the area is quite empty. Well this ends the long shot theory of this game taking place in the real world. Still maybe this region will be based off of France...or Europe....or Las Vegas? Just kidding. I like this region though from what I know of it. It has already been confirmed that the region is based off of France. Ok France that makes sense. Should be interesting. Also this probably also kills another long shot of being able to travel to other regions since I assume this would be pretty far from the other 5 regions. "If I'm flying solo at least I'm flying free,"
Does remind me of Fiore... But I doubt it is. Do you guys think we're gonna have Disneyland or something? You know, as a Game Corner or a big version of the Nimbasa funfair. Actually, the region in XD and Colusseum was Orre, not Fiore. Fiore was from Ranger. Yeah, it does have a lot of similarities with Orre, but what I find interesting is that it is kind of out of place. It's just a circle of desert surrounded by green. I don't know, it didn't seem as much as a desert to me as it did a large empty field filled with dead grass. Although I could easily be mistaken, as there's lava pools scattered about it, which aren't normally found out in open fields (except if you're playing Minecraft, of course). The area at the bottom looks like the starting town. If it's not there, then it must be near the island chain in the NW. Purple hand sticking out of water? It must be Fantina scuba-diving or something. She wears purple gloves, don't she? Plus, it's a French-based region, and she's French.